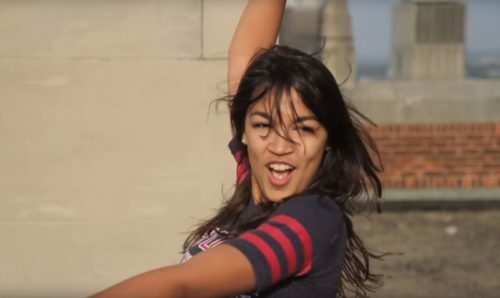 After a Twitter troll tried to make newly elected Congresswomen Alexandria Ocasio-Cortez look stupid by releasing a clipped video of her dancing on a rooftop in college, the progressive firebrand has gained even more popularity. Just like when Texas Senator Ted Cruz’s campaign tried to portray challenge Beto O’Rourke as a party animal by releasing video of him performing with a punk band and looking like a typical college student, the attempt backfired spectacularly. Twitter user @AnonymousQ1776 called the Congresswoman a “clueless nitwit” and “America’s favorite commie-know-it-all” in the tweet. After the plan to embarrass her exploded, the user deleted the entire account. The video was part of a larger 2010 piece, the “Boston University Brat Pack Mashup,” filmed when she was a student .Ocasio-Cortez was recreating the dance scene from “The Breakfast Club” alongside other students. Similar videos were a viral trend at the time. The complete video is at the bottom of this post. Wow. New footage appears to show Alexandria Ocasio-Cortez being… uh… adorable? This is like when Cruz’s campaign released video of Beto with his punk rock band.